The blog below is authored by Peter Beitsch, MD based on a summary article of several studies about one technology. Natera has developed a very cool approach to recurrence monitoring that also has broader implications for early detection of undiagnosed cancers (think screening for pancreatic, colon, lung, renal cell, etc). 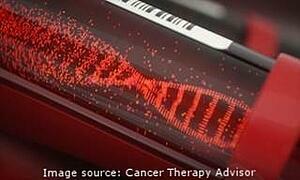 Natera takes the patient's own cancer cells and performs whole exome sequencing. They then develop a panel of DNA sequences that contain the cancer's unique DNA mutations (cancers share many of the same the genes that are mutated but they mutated in many different locations as well as uniquely mutated genes for that specific cancer): usually consisting of about 16 sequences. Think of this as a 16 digit password: we all use the same numbers but the chances of two 16 number passwords being the same are essentially impossible (10,000,000,000,000,000 possibilities - that is why credit card numbers are 16 digits). This patient-specific 16 segment DNA assay is then used to find circulating cell free DNA pieces in the patient's serum. If the assay identifies 2 or more fragments, there is cancer somewhere in the body; usually smaller than detectable with current imaging. Clinically annotating the assay with treatment given and response to that treatment, would allow AI/ML (artificial intelligence/machine learning) to identify the best treatment based on the DNA mutations present --regardless of the tissue of origin. This is mutation-driven personalized treatment rather than population-based tissue dependent treatment. Lastly, data from multiple assays could be mined for development of a screening assay for diagnosis of cancer and identification of the tissue of origin. Super exciting era we are entering!